Amazing Yamaguchi No. 009 Batman action figure unboxing and review – AiPT! Watch us unbox the most posable Batman figure ever. The Amazing Yamaguchi line of action figures is the primo series of figures for anyone who likes to pose their figure in the most wild ways. I’ve bought plenty of them, from Spider-Man, to Venom, to Spider-Gwen, and Deadpool too. So far each of these figures has impressed in a variety of ways be it the paint job, the accessories, and the incredible ways you can display these figures. The latest in the line is shipping now to America and it’s possibly the most famous superhero in the world: Batman. I’ve been looking forward to this figure for quite a while due to the incredible things you can do with the cape. Most action figure capes are one piece of bendy plastic or cloth, but this figure has a hard plastic cape that comes in pieces that you can connect and form as you wish. It’s a great idea especially for the Batman character since his cape is such a big part of his design. As you can see this is a very cool figure and well worth the $80 price tag. The cape is by far the coolest part of this figure, but he comes with some great accessories and plenty of hands to put him into different poses and fighting situations. There’s nice detailing on the body sculpt too and I’m very glad it came with two mouths since the sad mouth isn’t my cup of tea. I don’t normally comment on the box, but I was pleasantly surprised by all the art covering it. I’m not sure why there’s a Shazam character on the inside of the box, but I will admit it’s a haunting image of Batman to mix things up. Negatives are slim and more of a preference thing, but I don’t like the emblem on the chest that much and it’s too bad there’s a slight paint defect on the head. 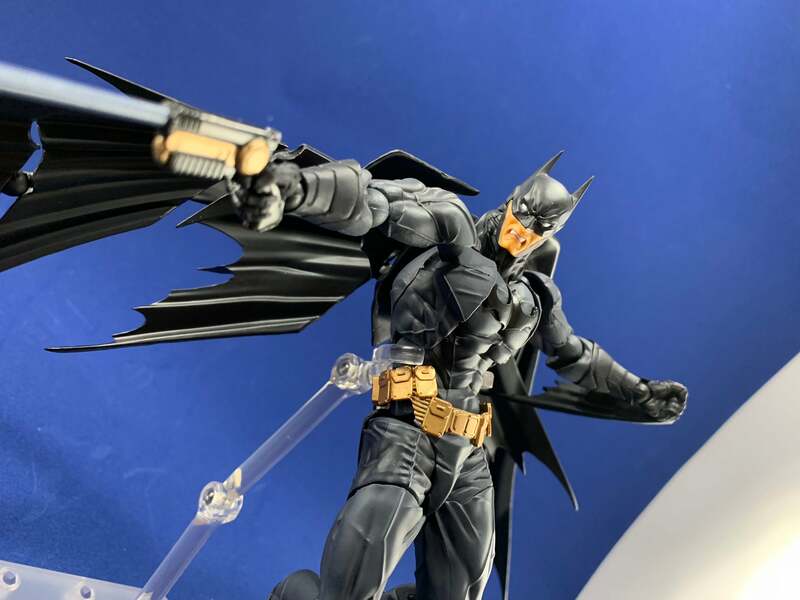 This is a sweet figure that I think Batman collectors will have to buy. The different ways you can pose the the cape alone is worth checking this figure out. You can buy it right now on Amazon or go to your local comic shop and get it there. Quite a cool toy and possibly one of the best in the Yamaguchi line.